The match between Al Ahly and Al Wadad Al Maghraby will be broadcast live on Saturday 4/11/2017 at 10 pm at Mohamed V Stadium in the final leg of the African Champions League final. 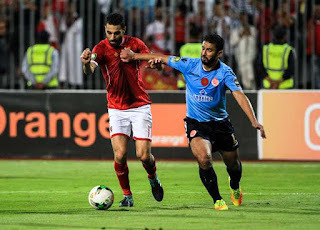 Al-Ahly had a positive equalizer for a 1-1 draw at the Borg el-Arab Stadium in Alexandria after the Wydad players were able to defend their own goal against the red attacks that crashed on the Moroccan team's black defenses. The fans of the Ahlawi themselves wanted a goal in Casablanca, such as the goal of Sfaxien, reaping the African title after a four-year absence since 2013 in the championship crowned by Ahli at the expense of Orlando, especially as Ahli is the only team that managed to beat the Moroccan Wydad, In the last ten clashes in Casablanca, during the African Championship in the last version, when Al Ahli won the first goal scored by Rami Rabieh defender Red. Al-Ahli is suffering from an absence of players in the team due to the injuries that hit the Red Card recently. In the forefront is Ahsam Ashour, who is also a midfielder. He also missed the first leg because of the tight muscle. Al Ahly Saleh Juma, the playmaker, The latter due to the rear muscle that caused his departure before the completion of the game of the coast of the coast by the return of the semi-finals. The red giant is also seeking to regain his favorite title "the most capped continental champions in the world" after being kidnapped by the Spanish giant Real Madrid, because of the departure of Ahli for the continental crown for a long time. Hossam Al-Badri, the coach of Al-Ahli club, has largely settled on the formation of the team for the Moroccan Wydad Casablanca match in the final leg of the African Championship.